During the consultation patients will have a one to two hour meeting with our Board Certified Oncologist to discuss their diagnosis. At this time you will have a physical exam, talk about your medical history, and maybe have additional imaging tests, conveniently available on site. After the doctor reviews all of the records and images and examines the patient, she or he will explain in detail the course of action, as well as options and alternatives that concern each individual patient. Clinical support, financial counseling, and further information on resources are also available. “Simulation” is the process of measuring anatomy and marking the skin in order to guide the radiation to the exact location prescribed by your radiation oncologist. To be most effective, the radiation beam must be aimed precisely at the exact tumor location each time your treatments are given. The first step in the simulation process is determining the exact position in which you will be treated. The radiation therapist and Radiation Oncologist will work together with you to create the best position for you to hold still during your treatment. The second step involves fitting you with a customized immobilization device that will be used to position you for your daily treatments. The third step is obtaining images (usually a CT scan and possibly an MRI) which will guide the radiation oncologist in locating your tumor(cancer). The fourth step involves placing permanent tattoos so that the correct spot will be targeted for treatment. The tattoo is permanent yet small enough that only the radiation therapist can see it. The whole “simulation” process takes approximately 20-30 minutes. Historically, the three main divisions of radiation therapy are external beam radiation therapy (EBRT or XRT) or teletherapy, brachytherapy or sealed source radiation therapy, and systemic radioisotope therapy. IPMC utilizes external beam radiation therapy. After simulation, the radiation oncologist then determines the exact area that will be treated, the total radiation dose that will be delivered to the tumor, how much dose will be allowed for the normal tissues around the tumor, and the safest angles (paths) for radiation delivery. IPMC uses sophisticated treatment planning computers to design the details of the exact radiation plan that will be used. After approving the plan, the radiation oncologist authorizes the start of treatment. Before the first day of treatment, and at least weekly after that, numerous checks are made to ensure that the treatments are being delivered exactly the way they were planned, what we call “Quality Assurance”. Once all of the planning has been completed, you will come to the department to get treatment started. The radiation therapist will bring you into the treatment room, set you up on the treatment table in the exact position with the immobilization device that was designed for you. The therapist will align you in your treatment position using lasers and tattoos that have been given to you during your initial simulation. Again, calculations will be checked and rechecked. The radiation machine is pictured below. Various types of radiology imaging are used daily, prior to your radiation treatment delivery, to ensure treatment fields and simulation fields are aligned. Some types of imaging include: x-rays, ultrasound, and cone beam CT.
Once alignment has been confirmed, treatment will begin. The machine and treatment table may rotate up to 360 degrees, allowing the radiation to hit the tumor from all angles. You will not be able to feel the radiation. Your radiation therapist will be able to see, hear and talk to you at all times while you are getting EXRT. Radiation therapy is given once a day, 5 days a week, Monday through Friday, at the same time each day. The number of treatments that you receive depends on multiple factors and can vary from 2 to 9 weeks. 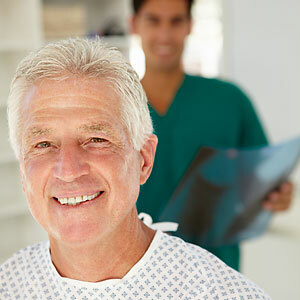 Radiation treatments are given as outpatient treatments and take about 15 minutes. The actual radiation is only a few minutes. We begin treatments at 6 am to accommodate the patient’s schedule. It is very important to not miss any treatments. During your course of radiation treatments, you will be scheduled to meet with the Radiation Oncologist Doctor at least once a week. However, our Radiation Oncologist Doctor is available anytime for questions or concerns. On the final day of treatment, you will be given specific instructions as well as an appointment for your first follow-up with our radiation oncologist approximately one month later. This visit is to ensure that any side effects you experienced are improving. At that initial follow-up further recommendations will be made including scheduling any needed tests, coordinating visits with your other physicians, and setting up future evaluations based on national guidelines.